German Hebraist; born at Posen, Prussian Poland, in 1788; died at Williamsburg, N. Y., Feb. 20, 1871. He was educated at Posen, but in 1814 went to England and was appointed minister to the Plymouth congregation, teaching Hebrew at the same time at the University of Oxford. His faith debarred him from a professorship, but among his pupils were numbered many distinguished Christian and Jewish scholars. While in London Newman took part in a spirited debate with some Christians on the Messianic prophecies. At an advanced age he sailed for America and settled in New York, gaining a livelihood as teacher and writer. In 1850 he published a work entitled "The Challenge Accepted," consisting of a series of dialogues between a Jew and a Christian respecting the fulfilment of the prophecies on the advent of the Messiah. 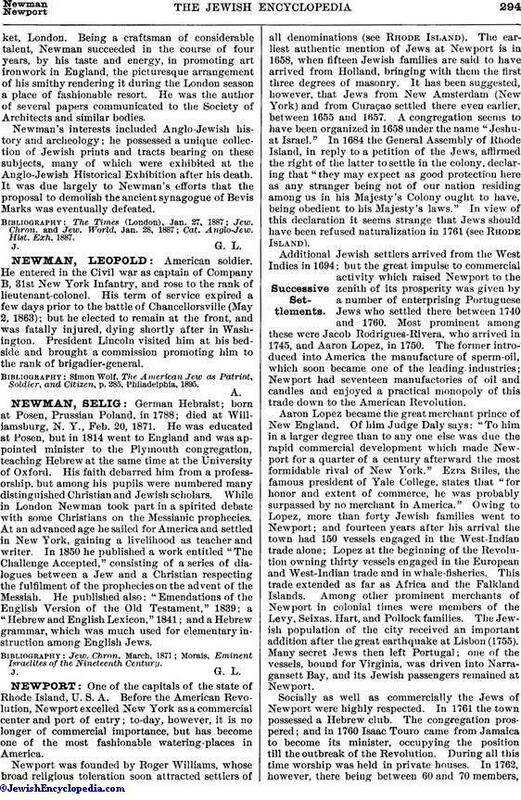 He published also: "Emendations of the English Version of the Old Testament," 1839; a "Hebrew and English Lexicon," 1841; and a Hebrew grammar, which was much used for elementary instruction among English Jews. Morais, Eminent Israelites of the Nineteenth Century.